Members of the IFN regulatory factor (IRF) family regulate gene expression critical to immune response, hemopoiesis, and proliferation. Although related by homology at their N-terminal DNA-binding domain, they display individual functional properties. The distinct properties result from differences in regulated expression, response to activating signals, and interaction with DNA regulatory elements. IRF-3 is expressed ubiquitously and is activated by serine phosphorylation in response to viral infection or TLR signaling. Evidence indicates that the kinases TANK-binding kinase 1 and inhibitor of NF-κB kinase-ε specifically phosphorylate and thereby activate IRF-3. We evaluated the contribution of another member of the IRF family, IRF-5, during viral infection since prior studies provided varied results. Analysis of phosphorylation, nuclear translocation, dimerization, binding to CREB-binding protein, recognition of DNA, and induction of gene expression were used comparatively with IRF-3 as a measure of IRF-5 activation. IRF-5 was not activated by viral infection; however, expression of TANK-binding kinase 1 or inhibitor of NF-κB kinase-ε did provide clear activation of IRF-5. IRF-5 is therefore distinct in its activation profile from IRF-3. However, similar to the biological effects of IRF-3 activation, a constitutively active mutation of IRF-5 promoted apoptosis. The apoptosis was inhibited by expression of Bcl-xL but not a dominant-negative mutation of the Fas-associated death domain. These studies support the distinct activation profiles of IRF-3 in comparison to IRF-5, but reveal a potential shared biological effect. A successful defense response to microbial infection requires the activation of specific latent transcription factors. These factors serve as molecular switches to induce a subset of genes that are critical for host defense. Certain members of the IFN regulatory factor (IRF)5 family are activated in response to infection, and consequently regulate the expression of genes that function in innate immunity (1, 2, 3, 4, 5, 6, 7, 8, 9, 10). There are nine members of the mammalian IRF family that function in microbial defense, cellular survival, and hemopoietic development (11, 12). Some of the IRFs are expressed ubiquitously, some are expressed in a tissue-specific manner, and some are expressed conditionally following gene induction. The members share a homologous DNA-binding domain at their N termini that allows recognition of a core DNA sequence GAAA (13, 14, 15). This core target sequence is usually embedded in a more complex DNA regulatory element such as the IFN-stimulated response element (ISRE) (2, 16, 18) or the IFN-β-positive regulatory domain (17, 19). The C regions of the IRFs are clearly different, and this diversity promotes their interaction with distinct transcription factors and results in their ability to regulate both unique and common target genes. The cellular localization of transcription factors that serve as signaling molecules is understandably critical to their function. One member of the IRF family, IRF-3, plays a key role in response to viral infection and is necessary for the transcriptional induction of the type I IFN genes and a subset of IFN-stimulated genes (ISGs) (20). IRF-3 pre-exists in a latent state in the cytoplasm of all cells, but accumulates in the nucleus following activation in response to viral infection or TLR-3 and -4 signaling (21, 22, 23). IRF-3 is activated by specific serine phosphorylation, and this modification leads to a conformational change that allows it to homodimerize, accumulate in the nucleus by tight association with histone acetyl transferases (CREB-binding protein (CBP) and p300), and to bind to specific DNA targets (3, 4, 5, 6, 8, 24). Only in response to direct serine phosphorylation does IRF-3 accumulate in the nucleus, and two kinases have been identified that are capable of this activation, NF-κB-activating kinase/TANK-binding kinase 1 (NAK/TBK1) and inhibitor of NF-κB kinase-ε (IKKε)/IKK inducible (25, 26). Targeted gene knockout studies have supported an essential role of NAK and IKKε for a successful innate immune response to viral infection (27, 28). A less well-characterized IRF family member, IRF-5, was demonstrated recently to play an intrinsic part in innate immunity. IRF-5 is expressed primarily in lymphocytes and dendritic cells, but it is induced in other cells in response to type I IFN (29). Animals with a targeted gene disruption of IRF-5 were found to have defective responses to TLR signaling and specifically survived challenge with lethal doses of LPS (TLR-4) or CpG oligodeoxynucleotide (TLR-9) (30). Additional studies have demonstrated activation of IRF-5 in the response to an imiquimod derivative R-848 (TLR-7/8), and also to viral infection with the paramyxovirus Newcastle’s disease virus (NDV) (31, 32). To elucidate the mechanisms that stimulate IRF-5, we have characterized the response of IRF-5 to viral infection with NDV or to overexpression of the kinases TBK1 or IKKε. The function of TBK1 or IKKε has been shown to be essential for the phosphorylation of IRF-3 during viral infection (25, 26). 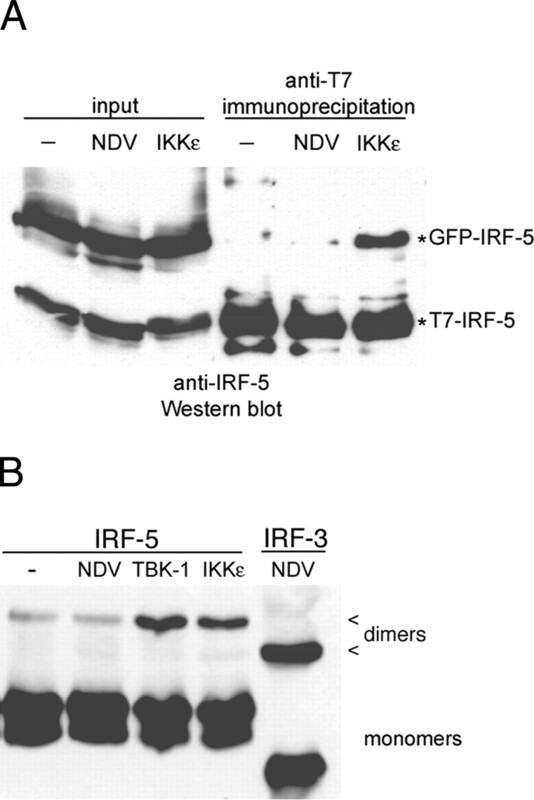 Unexpectedly, we find that IRF-5 is not activated in response to NDV infection, but it is activated by the TBK1 or IKKε kinases. In addition, the response of IRF-5 to phosphorylation by TBK1 or IKKε promotes apoptosis. Human HEC-1B, HT1080, HeLa Cl2, and THP1 cells were obtained from American Type Culture Collection. Mouse embryo fibroblasts from IRF-3 knockout animals (irf3−/−) and wild-type siblings and were gifts from Dr. T. Taniguchi (University of Tokyo, Tokyo, Japan). Human Huh7 cells were obtained from Dr. P. Sarnow (Stanford University, Stanford, CA). Cells were grown in DMEM with 8% FBS with the exception of THP1 cells maintained in RPMI 1640 medium with 8% FBS and 20 μM 2-ME. NDV (NJ-LaSota-1946), a gift from Dr. P. M. Pitha-Rowe (Johns Hopkins University, Baltimore, MD), was propagated in embryonated hen eggs and titers were determined by hemagglutination assay. Infections were performed at 100 hemagglutination units/ml or with allantoic fluid from mock-infected hen eggs for 6 h. Leptomycin B (LMB) was a gift from B. Wolff-Winiski (Novartis Research Institute, Vienna, Austria). The human gene encoding IRF-5 variant 5 was amplified from THP1 cDNA prepared by RT-PCR with primers using Pfu Turbo polymerase (Stratagene). AflII and XbaI restriction sites were constructed in the primers as the cloning sites (5′-ACTTAAGATGAACCAGTCCATCCCAGTG-3′, 5′-ATCTAGATTATTGCATGCCAGCTGGGTG-3′). The cDNA was cloned into pcDNA3 containing a T7 epitope tag (T7-IRF-5) at the N terminus, GFP-IRF-5 was generated by cloning into the pcDNA-GFP as described (33). IRF-5 mutants were constructed by Quick Change mutagenesis kit (Stratagene) and verified by sequencing. For analyses of IRF-5 variants, human B and T lymphocytes obtained from two different healthy donors (Long Island Blood Services, Westbury, NY) were isolated by Lymphoprep (Invitrogen Life Technologies). Cytoplasmic RNA was isolated from 2 × 108 cells using the Qiagen RNeasy kit and selection on Qiagen Oligotex mini columns. cDNA was generated with random hexamer primers and SuperScriptII (Invitrogen Life Technologies) according to the manufacturer’s protocol. IRF5 cDNA was amplified by PCR using primers for full-length IRF-5 and nested primers to amplify the most variable region. Full-length IRF-5 was amplified using Pfu Turbo polymerase and primers as described previously. The internal domain was amplified with Platinum Taq polymerase (Invitrogen Life Technologies) with primers 5′-CCCAGCCCCCTGAGGATT-3′ and 5′-AGGGGGCTGGGGTCTGGA-3′. The PCR products were cloned and sequenced. FLAG-TBK1 and hemagglutinin (HA)-IKKε were gifts from Dr. M. Karin (University of California, San Diego, CA). The ISRE-luciferase reporter was described in Ref. 33 . The IFN-β-luciferase was constructed by cloning the IFN-β promoter by PCR with primers, 5′-TCAGGTCGTTTGCTTTCCTT-3′ and 5′-TTGACAACACGAACAGTGTCG-3′ upstream of the firefly luciferase gene in pGL3-Basic vector (Promega). Bcl-xL and the dominant-negative form of the Fas-associated death domain (DNFADD) were gifts from Dr. Colin Duckett (University of Michigan, Ann Arbor, MI). Fugene6 (Roche) was used as the transfection reagent. Cells were lysed in 50 mM Tris (pH 7.6), 400 mM NaCl, 0.5% Nonidet P-40, 5 mM EDTA, 50 mM sodium fluoride, 2 mM sodium vanadate, protease inhibitor mixture (Sigma-Aldrich), and 1 mM PMSF (Sigma-Aldrich). The insoluble material was removed by centrifugation at 12,000 × g and 4°C. For immunoprecipitation, lysates were prepared from 10-cm plates and the NaCl concentration was reduced to 250 mM. Lysates were precleared with protein G-agarose slurry (Invitrogen Life Technologies), and incubated with specific Abs at 4°C overnight. Immunocomplexes were collected on protein G beads, the complexes were washed with lysis buffer, and eluted from the beads with SDS-sample buffer before separation on SDS-PAGE. Prestained protein standards were obtained from Crystalgen. Western blotting was performed following transfer to Immobilon-P (Millipore), and incubation with primary Ab (1/3000) and secondary Abs (Amersham) and visualized by ECL. Native PAGE for detecting protein dimers were prepared without SDS and the gel was prerun for 30 min at 4°C with 0.5% deoxycholate in the cathode chamber (34). A total of 0.5% deoxycholate was added to lysate samples before addition of sample buffer lacking SDS and 2-ME. Following electrophoresis at 4°C, the proteins were transferred to Immobilon before Western blot. Anti-CBP Abs (A-22), anti-p300 Abs (N-15), and normal rabbit IgG were purchased from Santa Cruz Biotechnology. Anti-GFP Ab was purchased from Roche. Ab to the T7 epitope was purchased from Novagen. Anti-FLAG M2 mAb and anti-α-tubulin were obtained from Sigma-Aldrich. Anti-poly(ADP-ribose) polymerase (PARP) p85 fragment Ab was obtained from Promega, anti-HA Ab (12CA5) was obtained from Roche Applied Science. Polyclonal anti-IRF-5 Ab was generated by immunizing rabbits with GST fusion protein of polypeptide 119–212 of human IRF-5. Polyclonal anti-IRF-3 Ab was used as described (4). Cells seeded on coverslips were fixed in 4% paraformaldehyde and either visualized directly for GFP with a Zeiss Axioskop or processed for immunofluorescence before visualization. For immunofluorescence, cells were permeabilized in 0.2% Triton X-100 in PBS, blocked in 10% goat serum/PBS, and incubated in anti-HA Ab in blocking solution in 1/200 dilution at room temperature for 1 h. Secondary Abs conjugated to rhodamine (Jackson ImmunoResearch Laboratories) were applied at 1/200 dilution for 1 h at room temperature. Coverslips were washed with PBS and mounted in antifade solution (Vectashield; Vector Laboratories). Cells were incubated with 250 μCi of [32P]orthophosphate (DuPont NEN) per milliliter in phosphate-free medium for 1 h before NDV infection, and were maintained in radiolabel during 6 h of infection (4). Uninfected controls were radiolabeled in a similar manner. Cell lysates were prepared, normalized for equivalent trichloroacetic acid-precipitable radioactivity, and subjected to immunoprecipitation with either anti-GFP or anti-T7 Abs. Proteins were separated by SDS-PAGE, and visualized by autoradiography. The EMSA was performed as described (4). The probe used was a dsDNA oligonucleotide containing the ISG15 ISRE: 5′-GGGAAAGGGAAACCGAAACTGAAG-3′, end-labeled with [γ-32P]ATP. Nuclear extracts were prepared and incubated with the radiolabeled probe for 20 min at room temperature. Specific Abs were incubated with nuclear extracts at 4°C for 60 min before the addition of the probe. Complexes were separated on 4.5% native gels at 4°C and visualized by autoradiography. RNA was isolated 36 h posttransfection by RNeasy mini kit (Qiagen) according to manufacturer’s protocol, cDNA was synthesized by oligo-dT primer (Invitrogen Life Technologies) and was subject to real-time PCR with primers for murine ISG54 (5′-GGGCTTCATCCAGCAACAGC-3′; 5′-CCTCCTCACAGTCAAGAGCAGG-3′) and IL-6 (5′-TCTACTCGGCAAACCTAGT-3′; 5′-CCAAGAAACCATCTGGC-3′) with a Light Cycler (Roche) based on manufacturer’s specifications. Each PCR amplification was normalized to actin RNA (5′-ATGCTCTCCCTCACGCCATC-3′; 5′-CGCACGATTTCCCTCTCAGC-3′). Luciferase assays were performed with T7-IRF-5, T7-IRF-5/4A, T7-IRF-5/4D, T7-IRF-3, or pGEM (Promega) and ISRE luciferase gene or IFN-β luciferase gene. Five hundred nanograms of HA-IKKε and 100 ng of β-galactosidase gene as the internal control were cotransfected into each sample. Firefly luciferase was recorded using a Lumat model LB 9507 luminometer and normalized to β-galactosidase expression. The data shown were averaged from three independent experiments. Cells on coverslips were fixed in 4% paraformaldehyde/PBS, permeabilized with 0.5% Triton X-100/PBS, washed and stained with 6-diamidino-2-phenylindole (DAPI) at 0.01 μg/ml (33). TUNEL assay was performed following DAPI staining by In situ Cell Death Detection kit TMR Red (Roche) according to manufacturer’s directions. For PARP-1 cleavage assay, cells were lysed in isotonic lysis buffer containing 140 mM NaCl, 50 mM Tris-HCl (pH 8.0), 5 mM EDTA, 0.5% Nonidet P-40, 1 mM PMSF, 1 mM DTT, 1× protease inhibitor mixture (Sigma-Aldrich). Nuclei were separated by centrifugation at 12,000 × g, 4°C. Cytoplasmic protein was quantified by Bio-Rad assay and the corresponding ratio of nuclear protein was separated on SDS-PAGE and processed for Western blotting. Various isoforms of human IRF-5 have been described, and these likely result in part from differential splicing of the nine exons encoding IRF-5 (35). We generated an IRF-5 cDNA by RT-PCR from mRNA encoded by the human monocyte cell line THP1. This cDNA is now designated variant 5 (v5) and is the longest of the characterized variants encoding a protein of 514 aa. A partial sequence comparison of some of these variants is provided in Table I⇓. To ensure the appropriate use of v5, we evaluated the IRF-5 mRNA species from a mixed pool of B and T lymphocytes from several healthy donors. To eliminate the presence of inaccurate splice forms, nuclear and cytoplasmic cell fractions were prepared, and RNA was used only from the cytoplasmic pool to examine IRF-5 mRNA species by RT-PCR. We identified the presence of IRF-5 variants v1, v3/4, and v5, in relatively equal proportion (data not shown). Because most prior studies used total cellular RNA to generate IRF-5 cDNA, the existence of many variants may represent inaccurate or incomplete splice forms that do not accumulate in the cytoplasmic mRNA pool. Variant v9 encodes only the IRF-5 DNA-binding domain (1–157 aa), whereas v7 lacks the DNA-binding domain and is predicted to encode a truncated protein (110–389 aa). These variants may function as negative interfering molecules. However, the encoded proteins of these variants have not been identified, and so activity cannot be confirmed. Because the IRF-5 variant v5 was well-represented in the cytoplasmic mRNA from primary lymphocytes, we focused our studies on this isoform. Cells respond to viral infection with the activation of serine kinases that phosphorylate latent IRF-3, a modification that is required for its transcriptional ability. Viral infection has been reported to activate IRF-5, and so to determine whether IRF-5 is also modified by phosphorylation during viral infection, we evaluated phosphorylation by metabolic radiolabeling of cells in the presence of [32P]orthophosphate (Fig. 1⇓). HEC-1B cells that cannot respond to autocrine IFN during the course of infection were cotransfected with expression plasmids encoding GFP-tagged IRF-5 (GFP-IRF-5) or T7-tagged IRF-3 (T7-IRF-3). The cells were cultured in the presence of [32P]orthophosphate, and infected with NDV for 6 h. The NDV paramyxovirus was used because it produces significant viral dsRNA and is a potent activator of IRF-3 and type I IFN production. Cells were lysed, the IRF-5 or IRF-3 proteins were immunoprecipitated with specific Abs, and phosphate modification was evaluated by autoradiography following SDS-PAGE. A comparative analysis clearly demonstrated that following viral infection there was no increase in phosphorylation of IRF-5 (lanes 1 and 2), whereas there was a significant increase in IRF-3 phosphorylation (lanes 4 and 5). The slower mobility phosphorylated isoforms of IRF-3 serve as an indicator of a productive viral infection. Although IRF-5 was not phosphorylated in response to viral infection, it did appear to be a substrate of TBK1/IKKε. Cotransfection with IKKε resulted in an increase of phosphorylation for both IRF-5 and IRF-3 (lanes 3 and 6). These results indicate that IRF-5 does not respond to viral infection, but is phosphorylated in response to IKKε expression. 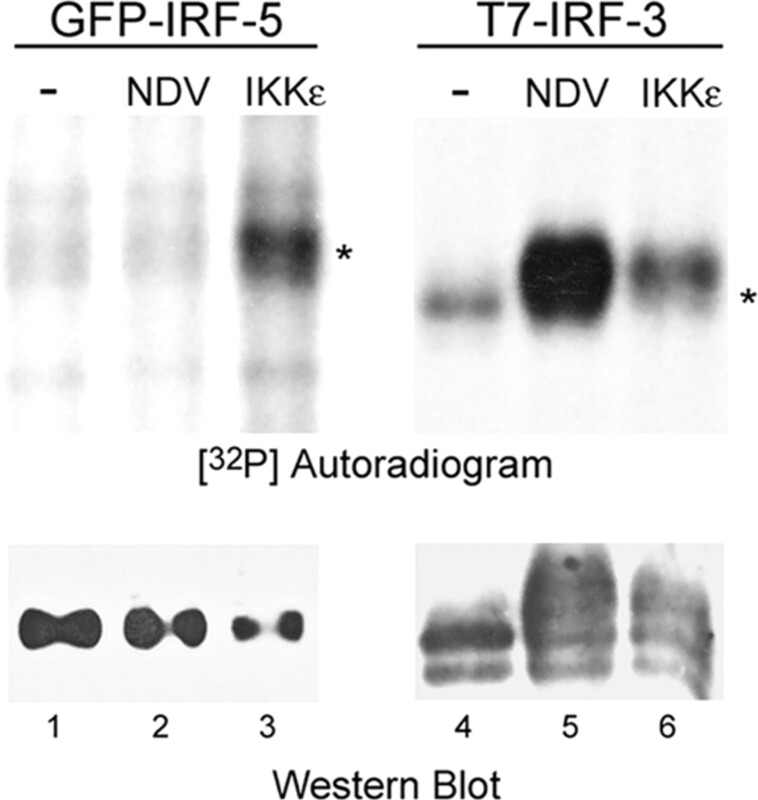 IRF-5 phosphorylation by coexpression of IKKε, but not by NDV infection. HEC-1B cells were cotransfected with plasmids encoding GFP-IRF-5 and T7-IRF-3 (lanes 1, 2, 4, and 5), or with GFP-IRF-5, T7-IRF-3, and IKKε (lanes 3 and 6). Cultures were incubated in the presence of [32P]orthophosphate and left untreated or infected with NDV for 6 h (lanes 2 and 5). Top panel, Abs to GFP or T7 were used to immunoprecipitate GFP-IRF-5 or T7-IRF-3. Proteins were separated by SDS-PAGE, and [32P] modification was detected by autoradiography. Bottom panel, 50 mg of each lysate was analyzed by Western blot with anti-GFP (lanes 1–3) or anti-T7 (lanes 4–6) to evaluate protein levels of IRF-5 and IRF-3, respectively. Results are representative of three experiments. The nuclear/cytoplasmic redistribution of proteins is regulated by the function of nuclear localization sequences (NLS) or nuclear export signals (NES) on proteins destined for transport (36, 37, 38, 39). To evaluate the localization of IRF-5, we visualized the behavior of GFP-IRF-5 by fluorescent microscopy (Fig. 2⇓A). IRF-5 clearly resides in the cytoplasm of cells in the absence of any activating stimulus, similar to latent IRF-3. To determine whether IRF-5 is restricted to the cytoplasm or whether it shuttles between nucleus and cytoplasm, we tested the effect of an inhibitor of nuclear export, LMB. LMB blocks export mediated by the exportin carrier, CRM1 (40, 41). Treatment of cells with LMB for 1 h in the absence of any stimulus was found to cause IRF-5 to accumulate in the nucleus. This result indicates that IRF-5 dynamically shuttles in and out of the nucleus, but nuclear export is dominant. This is similar to the trafficking behavior of IRF-3 (42). Nuclear trafficking of IRF-5. A, HT1080 cells were transfected with GFP-IRF-5 or GFP-IRF3. Localization of GFP-IRF-5 (top panel) or GFP-IRF-3 (bottom panel) was evaluated in the absence of any treatment, following the addition of LMB for 1 h to the culture, following infection with NDV for 6 h, or following cotransfection with an HA-epitope tagged IKKε gene. The expression of the IKKε was confirmed by immunofluorescence of the same cells with anti-HA Ab as indicated. Images represent 70–100% of the cells in the cultures. B, Localization of GFP-IRF-5 encoding 1–150 aa, or 1–173 aa or full-length IRF-5 wild type (wt) or with substitutions of L150A or LL150,154AA. To determine whether IRF-5 redistributes from the cytoplasm to the nucleus in response to viral infection, cells expressing GFP-IRF-5 were infected with NDV for 6 h (Fig. 2⇑). During the course of infection GFP-IRF-5 remained predominant in the cytoplasm of the cell. In contrast, GFP-IRF-3 localized to the nucleus during the same viral infection. Because expression of IKKε was found to increase the phosphorylation of IRF-5 as shown in Fig. 1⇑, the effect of IKKε on IRF-5 nuclear accumulation was examined. Coexpression of IKKε clearly stimulated the nuclear accumulation of GFP-IRF-5, and, similarly, induced nuclear accumulation of GFP-IRF-3. Nuclear accumulation of IRFs was only present in cells expressing HA-tagged IKKε as detected by immunofluorescence. The dominant localization of latent IRF-5 in the cytoplasm, and its nuclear accumulation in the presence of the export inhibitor LMB indicate that IRF-5 has a constitutive NES. To identify the position of the NES within the protein, the cellular distribution of various deletion mutations was evaluated. A truncation containing 1–173 aa showed significant cytoplasmic expression in a majority of cells; however, a truncation containing 1–150 aa showed only nuclear accumulation (Fig. 2⇑B). These results indicated that a region critical for NES function was present within aa 150–173. The amino acid sequence in this region contains a leucine-rich hydrophobic domain between 150 and 160 aa, similar to the NES recognized by CRM1. To more precisely identify the NES, site-directed mutagenesis was used to evaluate the contribution of leucine residues within this sequence. A single amino acid substitution of leucine at position 150 to alanine (L150A) disrupted the NES function within the native IRF-5 molecule. An additional substitution of leucine at position 154 (L150A/L154A) generated even more apparent nuclear accumulation. Based on these observations, this region of IRF-5 serves as a constitutive NES to position the protein in the cytoplasm until an activating signal allows it to accumulate in the nucleus. Site-specific phosphorylation has been shown to alter the conformation of proteins such as the IRF-3 molecule and promote their homodimerization (43, 44). Because IKKε phosphorylated IRF-5 and stimulated its nuclear accumulation, we evaluated the possibility that activated IRF-5 could dimerize. Two assays were performed to assess IRF-5 self-interaction, coimmunoprecipitation and altered migration in nondenaturing gel electrophoresis. If IRF-5 gains the ability to dimerize or oligomerize following activation by phosphorylation, protein association could be detected by coimmunoprecipitation of IRF-5 molecules with distinct epitope tags. For this reason, cells were cotransfected with plasmids encoding GFP-IRF-5 and T7-IRF-5, and were untreated or infected with NDV for 6 h (Fig. 3⇓A). In addition, cells were cotransfected with GFP-IRF-5, T7-IRF-5, and IKKε. Detergent cell lysates were prepared and T7-IRF-5 was immunoprecipitated with anti-T7 Abs. Proteins in the immunocomplexes were resolved on SDS-PAGE, and the presence of T7-IRF-5 or GFP-IRF-5 was detected by Western blot with anti-IRF-5 polyclonal Ab. Because the GFP-tagged IRF-5 migrates more slowly than T7-IRF-5, the presence of each species is easily evaluated. The Western blot detected a significant induction of protein-protein association of T7-IRF-5 with GFP-IRF-5 in the presence of coexpressed IKKε kinase. There was only minimal basal association detected in the untreated or NDV-infected lysates, and this was not always apparent. These results indicate that a significant dimerization of IRF-5 occurs following specific phosphorylation by the IKKε kinase. To determine whether IRF-5 heterodimerizes with activated IRF-3, similar coimmunoprecipitation assays were performed, but in contrast to other reports, no association was detectable with IRF-3 (data not shown). Thus, IRF-5 and IRF-3 appear to function in distinct transcription complexes. Dimerization of activated IRF-5. A, HEC-1B cells were cotransfected with GFP-IRF-5 and T7-IRF-5, and were untreated (−) or infected with NDV. In addition, cells were cotransfected with GFP-IRF-5, T7-IRF-5, and IKKε. T7-IRF-5 was immunoprecipitated with anti-T7 Abs, and proteins in the immunocomplexes were detected by Western blot with anti-IRF-5 Ab. B, Lysates from cells expressing T7-IRF-5 or T7-IRF-3 transfected or infected as in A and electrophoresed in nondenaturing gels, and proteins were identified by Western blot with anti-T7 Ab. Another method used to detect IRF dimerization was altered protein migration in nondenaturing gels (34). For this assay, cells were transfected with T7-IRF-5 and were untreated or infected with NDV for 6 h, or were cotransfected with T7-IRF-5 and TBK1 or T7-IRF-5 and IKKε (Fig. 3⇑B). As a positive control, cells were transfected with T7-IRF-3 and infected with NDV. Cell lysates were prepared, proteins were separated by electrophoresis in nondenaturing gels, and the T7-tagged IRFs were identified by Western blot. There was no change in IRF-5 migration following NDV infection, but cotransfection with TBK1 or IKKε generated a distinct increase in a slow mobility complex apparently representing an activated IRF-5 dimer. This result indicates an alteration in protein conformation occurs following specific phosphorylation. It is known that phosphorylated IRF-3 forms a strong association with the histone acetylases CBP and p300 in the nucleus. In fact, this association appears to be responsible for nuclear retention of IRF-3 (42). To determine whether activated IRF-5 binds to CBP/p300 in the nucleus, we performed coimmunoprecipitation assays (Fig. 4⇓). Endogenous CBP/p300 were immunoprecipitated from cells transfected with T7-IRF-5 or T7-IRF-3 and associated proteins were identified by Western blot with anti-T7 Ab. IRF-3 served as a positive control because it strongly associates with CBP/p300 only following activation by phosphorylation in response to either NDV infection or IKKε expression. The results clearly indicate that IRF-5 activated in response to IKKε can bind to CBP/p300, but NDV infection does not stimulate this association. The ability of phosphorylated IRF-5 to bind to CBP/p300 may confer transcriptional activity to the complex. Association of IRF-5 with CBP/p300. HEC-1B cells were transfected with T7-IRF-3 or T7-IRF-5 and were untreated (−) or infected with NDV (+). Cells were also cotransfected as indicated with IKKε (+). CBP/p300 Abs were used for immunoprecipitations, and the immunocomplexes were subjected to SDS-PAGE and Western blot with anti-T7 Abs. Because the IRF proteins share a similar DNA-binding domain that can recognize a core target site within the ISRE, we tested the ability of activated IRF-5 to bind to the ISRE. EMSAs were performed with radiolabeled oligonucleotide corresponding to the ISRE and lysates from HEC-1B cells expressing T7-IRF-5 or T7-IRF-3 with or without IKKε cotransfection or infection by NDV (Fig. 5⇓). HEC-1B cells lack an autocrine response to IFNs and therefore eliminate this signal pathway to ISRE-binding proteins (4). Specific Abs were included in the DNA-binding reactions to identify specific IRF complexes by elimination of the IRF-DNA complex. IRF-3 activated in response to NDV infection or IKKε expression clearly formed DNA-binding complexes. IRF-5 phosphorylated in response to IKKε, but not by NDV infection, demonstrated a detectable binding to the ISRE although not as robust as the IRF-3 complex. The complex was eliminated with specific IRF-5 Ab or with Ab to CBP or p300 (data not shown) indicating IRF-5 in association with CBP/p300 can weakly bind the ISRE. Binding of IRF-5 to the ISRE. EMSAs were evaluated with extracts from HEC1B cells transfected with T7-IRF-5 or T7-IRF-3 with or without cotransfection with IKKε or infection by NDV. Either no Abs (Ab) were added to the DNA binding reactions (−) or normal rabbit Ab (c), IRF-3 Ab, or IRF-5 Ab as indicated. The position of the IRF-3 and IRF-5 complexes are noted by an arrow. Effect of IRF-3 or IRF-5 on gene expression. A, Differential induction of ISG54 and IL-6 genes by IRF-3 and IRF-5. Murine embryo fibroblasts derived from IRF-3 knockout animals were transfected with the IKKε gene or cotransfected with the IKKε gene and either the IRF-3 or IRF-5 gene. Induction of endogenous ISG54 or IL-6 RNA was measured 36 h posttransfection by quantitative real-time PCR. B, IRF-3−/− cells were transfected with an ISRE-dependent luciferase reporter gene and the β-galactosidase gene as transfection reference. Cells were transfected with plasmid vector control, IRF-3, or IRF-5 with or without IKKε as indicated. Results are expressed as relative luciferase activity. C, Cells were transfected with IRF-3, IRF-5/4A, or IRF-5/4D and treated as described in A. Results are expressed as relative luciferase activity. D, HT1080 cells were transfected with GFP-IRF-5, GFP-IRF-5/4A or GFP-IRF-5/4D, and cellular localization was evaluated by fluorescence microscopy. Because the IRF-3 protein is modified by serine phosphorylation at the C terminus in response to viral infection, we tested IRF-5 mutations that were modified in a similar region of the molecule. Site-directed mutagenesis was used to replace the serine residues at aa 451, 453, 456, and 462 to either alanine (IRF-5/4A) or aspartic acid (IRF-5/4D). The alanine substitution was expected to eliminate phosphorylation effects in this region, and the aspartic acid substitutions would possibly function as phosphoserine mimetics similar to the effect observed with a constitutively active IRF-3 mutant (8). Cells were transfected with IRF-5/4A, or IRF-5/4D, or IRF-3 as a positive control, with or without IKKε coexpression. The IRF-5/4A mutation had negligible effects on ISRE-dependent gene expression; however, the IRF-5/4D substitution functioned as a constitutively active molecule and significantly induced gene expression in the absence of IKKε. In fact, coexpression of IKKε did not increase the activity of IRF-5/4D. To evaluate the cellular localization of the constitutively active IRF-5/4D, expression of GFP-IRF-5/4D was examined by fluorescent microscopy (Fig. 6⇑C). In comparison to IRF-5 or IRF-5/4A, the active mutant IRF-5/4D accumulated constitutively in the nucleus in the absence of any stimulus. This mutation was also found to cause IRF-5 dimerization and binding to CBP (data not shown). The results suggest that a C-terminal phosphorylation event is critical for IRF-5 to function as a transcription factor. Several reports indicate IRF-5 plays a role in innate immunity, but some studies provide evidence that IRF-5 overexpression blocks cell cycle progression or sensitizes cells to DNA damage effects (29, 45). For this reason, we evaluated the contribution of IRF-5 to programmed cell death, and we used several assays to access apoptosis. Fig. 7⇓ displays the results of representative experiments accessing IRF-5 effects both on a single-cell basis, and on the cell population. Cells were transfected with GFP-tagged constructs with or without cotransfection with IKKε as indicated. Cells on coverslips were stained with DAPI and assessed microscopically for DNA damage by the TUNEL assay, either 42 or 66 h following transfection (Fig. 7⇓A). Transfections with GFP served as negative controls, whereas expression of IRF-3 with IKKε or the constitutively active IRF-3/5D served as positive controls. Cells that expressed GFP-IRF-5 alone elicited a low level of apoptosis; however, cotransfection with the IKKε promoted a significant apoptotic response. Expression of the constitutively active mutant of IRF-5, GFP-IRF-5/4D, promoted an even more apparent apoptotic effect. Phosphorylation of GFP-IRF-3 by IKKε stimulated the apoptotic potential of IRF-3, as expected, and the constitutively active IRF-3/5D elicited high levels of apoptosis independent of IKKε (33, 46). Activation of IRF-5 promotes apoptosis. A, HeLa cells on coverslips were transfected with GFP-tagged constructs as indicated with or without IKKε cotransfection (−/+). Nuclei were visualized by DAPI staining, and apoptosis was scored by determining the percentage of GFP-positive cells that were TUNEL positive at either 44- or 66-h posttransfection. Five visual fields were microscopically examined, and the average number of TUNEL-positive and green fluorescent cells as a percentage of total green fluorescent cells is provided. B, Cells were harvested from the same transfected cultures in A, and protein lysates were prepared and evaluated by Western blot 66 h following transfection for PARP-1 cleavage. C, Huh-7 cells were transfected with GFP-IRF-5, GFP-IRF-5/4D, GFP-IRF-3, or GFP-IRF-3/5D with or without Bcl-xL or DNFADD as indicated. Lysates were prepared 66 h following transfection, and Western blots were used to detect PARP-1 cleavage. Results are representative of multiple independent experiments. As an independent measure of apoptosis, we also evaluated the caspase cleavage of PARP-1, an enzyme required for DNA repair (47). Caspase activation results in the cleavage of PARP-1 into two fragments of 24 and 89 kDa, and this cleavage has been established as a characteristic of apoptosis. For this assay, the same transfected cultures that were analyzed morphologically for apoptosis were lysed, and PARP-1 cleavage was detected by Western blot with an Ab that detects the p85 cleavage product (Fig. 7⇑B). There was a low level of background PARP-1 cleavage in the cultures transfected with IRF-5, but cotransfection of IKKε with IRF-5 increased the levels of PARP-1 cleavage. A similar effect of PARP-1 cleavage was produced by the constitutive active IRF-5/4D mutation, whereas the IRF-5/4A mutation did not induce PARP cleavage. GFP-IRF-3 was used as a positive control, and similar to IRF-5, it promoted apoptosis only after activation by IKKε, or as the constitutively active mutant, IRF-3/5D. These results clearly demonstrate that IRF-5 has the potential to induce apoptosis either following activation by IKKε phosphorylation or expressed as the constitutively active mutant IRF-5/4D. To investigate the mechanisms by which IRF-5 promotes apoptosis, we evaluated the effects of characterized negative interfering molecules (Fig. 7⇑C). The Bcl-2 family of proteins consists of antiapoptotic and proapoptotic members that act at cellular organelles such as mitochondria (48). Overexpression of members of the antiapoptotic subclass, including Bcl-xL, is able to prevent programmed cell death induced by various agents. Because these molecules function in intracellular organelles, the apoptotic mechanism is often referred to as intrinsic, or mitochondrial dependent. In contrast, extrinsic or mitochondrial-independent apoptosis often refers to the response of cells to extracellular ligands that bind to cell surface receptors such as members of the TNFR superfamily (49). These receptors do not exclusively induce extrinsic signal pathways, but they possess an intracellular death domain region that binds to an adaptor called the FADD, and a DNFADD has been shown to block apoptosis stimulated by this pathway. To compare the inhibitory effects of Bcl-xL or DNFADD on IRF-5-induced apoptosis, we cotransfected these modulators with the constitutively active form of IRF-5 or IRF-3, and evaluated PARP-1 cleavage as the assay to detect apoptosis (Fig. 7⇑C). Cells were transfected with GFP-tagged forms of IRF-5, IRF-5/4D, IRF-3, or IRF-3/5D in the absence or presence of Bcl-xL or DNFADD. The results clearly indicate that expression of Bcl-xL blocks caspase-induced cleavage of PARP-1 in response to either active IRF-5 or IRF-3, but the DNFADD is not able to block apoptosis by either IRF molecule. These results suggest that apoptosis by the IRF factors does not depend on paracrine or autocrine ligands that promote death through the TNFR molecule. Characterization of members of the IRF family indicates they have distinct contributions to innate or acquired immunity. Although they share a similar DNA-binding domain at their N terminus, they possess unique sequences that result in specific protein-protein and protein-DNA interactions. These distinctive interactions are responsible for both specificity of activation and individual function. IRF-3 is phosphorylated in response to viral infection or TLR-3 stimulation leading to its DNA-binding capability and transcriptional activity. The targeted gene disruption of IRF-3 demonstrated its critical role in IFN-β production and survival of viral infections (20). Previous studies with IRF-5 have reported that it plays a role in the response to viral infection (32, 50, 51), and more recently that it responds to stimulation of TLR-7, -8, and -9 (30, 31). In this report, we evaluated comparatively the activation of IRF-3 and IRF-5 in response to viral infection or specific kinase expression. We did not find IRF-5 activation in response to NDV, a virus previously described to activate IRF-5. 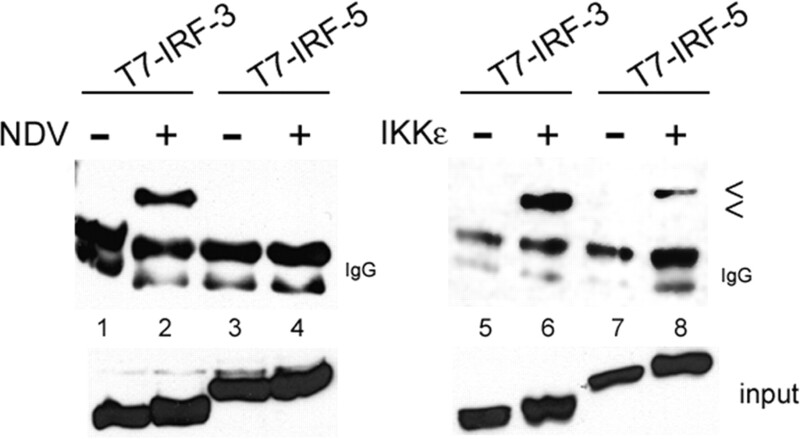 Intriguingly, we found IRF-5 to be activated in response to expression of kinases TBK1 or IKKε. These kinases are associated in complexes with multiple components and appear to respond to distinct pathways of activation by viral infection or TLR signaling (52, 53). It is possible that the signal pathway of activation is linked to downstream target specificity in vivo which would be coordinate with our findings. Activation of IRF-3 can be detected in several ways, by serine phosphorylation, dimerization, cytoplasmic to nuclear redistribution, binding to CBP or p300, binding to an ISRE-containing DNA target, and induction of reporter gene activity. We used these same parameters to evaluate the comparative activation of IRF-5 following either expression of kinases or viral infection. In a latent state, IRF-5 shuttles in and out of the nucleus and therefore it has active NLS and NES sequences (42). We identified an NES by mutational analysis of leucine residues at positions 150 and 154 (Fig. 2⇑B). A previous report noted the requirement of leucine residues 157 and 159 for export activity, and together the results indicate the NES sequence spans the region of aa 150–160 (LQRMLPSLSLT) (54). It is not clear why the previous study did not detect nuclear accumulation following phosphorylation by TBK1 or IKKε. We clearly found kinase expression increased IRF-5 phosphorylation and stimulated its nuclear accumulation (Figs. 1⇑ and 2⇑A). Our results with IRF-5/4D indicated that C-terminal phosphorylation may be a regulatory switch for nuclear accumulation. In addition, we showed that modification of IRF-5 in response to kinase activity promoted its dimerization, binding to CBP/p300, and binding to DNA. Dimerization indicates that like IRF-3, there is a conformational change of IRF-5 following phosphorylation. The altered conformation leads to the gain of its ability to bind CBP/p300 in the nucleus. This binding to CBP/p300 by IRF-5 may be responsible for its retention in the nucleus and ability to bind DNA, as is the case for IRF-3 (42). The ability of IRF-5 to induce gene expression was tested by evaluating its effect on endogenous genes as well as a reporter gene regulated by an ISRE in response to either TBK1 or IKKε. The IRF-5null animals appear to be deficient in the production of IL-6 and IL-12, and the ISRE elements in these genes have been proposed to respond to IRF-5 (30). We performed the studies in cells derived from an IRF-3 knockout animal so that the contribution of endogenous IRF-3 could be eliminated (20). The results show that activation of IRF-3 or IRF-5 can induce expression of endogenous ISG54 and IL-6 genes, but with differential effects (Fig. 6A). IRF-3 is a more effective inducer of ISG54, whereas IRF-5 has a greater stimulatory effect on IL-6. A reporter gene regulated by an ISRE was also tested. IRF-5 activated by IKKε could detectably induce the reporter; however, the induction is much less than that induced by phosphorylated IRF-3 (Fig. 6⇑B). It is possible that modifications in addition to phosphorylation by IKKε contribute to transcriptional activity, or that IRF-5 functions optimally in collaboration with other transcription factors. The exact sites on IRF-5 that are phosphorylated by TBK1 or IKKε remain to be determined. However, because substitution of serine residues with aspartic acid residues can generate a constitutively active IRF-3 molecule, we evaluated this approach with IRF-5 (43). Aspartic acid residues were substituted for serines in the C terminus of IRF-5 at positions 451, 453, 456, and 462 (IRF-5/4D). This IRF-5/4D mutation produced a molecule that had constitutive presence in the nucleus (Fig. 6⇑C), constitutive dimerization, and binding to CBP (data not shown). Alanine substitutions were also generated at the same positions to evaluate the requirement of these serine residues for the response to IKKε (IRF-5/4A). The effect on ISRE-reporter gene expression relative to IRF-3 demonstrated clearly that IRF-5/4D functions as a constitutively active transcription factor inducing gene expression ∼20-fold, whereas IRF-5/4A was refractory to effects of IKKε (Fig. 6⇑B). The results suggest that these serine residues are either targets of IKKε or are critical for the specificity of phosphorylation. A similar approach was used to substitute a serine cluster at 437–446 with aspartic acids on another IRF-5 variant and an ∼5-fold induction of IFN-α or IFN-β reporter genes was reported (54). Because IRF-5/4D appears to function constitutively, we evaluated whether its expression had demonstrable biological effects on cells. A prior study expressed the IRF-5 variant 3/4 in a B cell line and found that it promoted cell death without added stimulation (29). For this reason, we tested the effect of IRF-5 or IRF-5/4D on cell viability in comparison to IRF-3 or IRF-3/5D. Both IRF-5 and IRF-3 promoted apoptosis, but only if expressed with IKKε or as the constitutively activate mutant (Fig. 7⇑). Overexpression of Bcl-xL was found to inhibit the apoptotic effects of both IRF-5/4D and IRF-3/5D; however, the DNFADD molecule did not block apoptosis. FADD has been reported to be required for the upstream activation of IRF-3 in response to intracellular viral dsRNA (55). Our analyses indicate that FADD is not required for the downstream proapoptotic effects of IRF-3 or IRF-5. There is a delicate balance in the cellular response to stimuli that activate both proapoptotic and antiapoptotic signal pathways. The strength of distinct pathways may dictate the final outcome of the cell. In response to viral infection or TLR signaling, there are phosphorylation events that lead to activation of antiapoptotic molecules including transcription factors such as NF-κB as well as IRFs. We have tipped the balance and analyzed primarily the effects of activated IRF-3 or IRF-5 to identify their ability to promote apoptosis. In addition, in the context of viral infection our study clearly indicates that IRF-3 and not IRF-5 appears to be a primary IRF mediator. We have analyzed the behavior or IRF-5 v1 and find that it also responds to TBK1 or IKKε with nuclear accumulation. We thank all the members of the laboratory for their helpful discussions and support. Special thanks to Dr. Gregg Banninger for advice on protein localization studies, and to Jermel Watkins for propagation of virus. The gift of irf-3−/− cells from Dr. Tadatsugu Taniguchi is much appreciated. ↵1 This work was supported by grants from the National Institutes of Health (PO1CA2814 and PO1AI0555621). ↵2 Current address: Sankyo, Shinagawa-ku, Tokyo, Japan. ↵3 Current address: Rheogene, Norristown, Philadelphia, PA.
↵5 Abbreviations used in this paper: IRF, IFN regulatory factor; ISRE, IFN-stimulated response element; ISG, IFN-stimulated gene; NAK, NF-κB-activating kinase; TBK, TANK-binding kinase; IKK, inhibitor of NF-κB; NDV, Newcastle’s disease virus; LMB, leptomycin B; FADD, Fas-associated death domain; DNFADD, dominant-negative form of FADD; HA, hemagglutinin; CBP, CREB-binding protein; PARP, poly(ADP-ribose) polymerase; DAPI, 6-diamidino-2-phenylindole; NLS, nuclear localization sequence; NES, nuclear export signal. Akira, S., K. Takeda. 2004. Functions of Toll-like receptors: lessons from KO mice. C. R. Biol. 327: 581-589. Daly, C., N. C. Reich. 1993. Double-stranded RNA activates novel factors that bind to the interferon-stimulated response element. Mol. Cell. Biol. 13: 3756-3764. Yoneyama, M., W. Suhara, Y. Fukuhara, M. Fukuda, E. Nishida, T. Fujita. 1998. Direct triggering of the type I interferon system by virus infection: activation of a transcription factor complex containing IRF-3 and CBP/p300. EMBO J. 17: 1087-1095. Weaver, B. K., K. P. Kumar, N. C. Reich. 1998. Interferon regulatory factor 3 and CREB-binding protein/p300 are subunits of double-stranded RNA-activated transcription factor DRAF1. Mol. Cell. Biol. 18: 1359-1368. Wathelet, M. G., C. H. Lin, B. S. Parekh, L. V. Ronco, P. M. Howley, T. Maniatis. 1998. Virus infection induces the assembly of coordinately activated transcription factors on the IFN-β enhancer in vivo. Mol. Cell 1: 507-518. Sato, M., N. Tanaka, N. Hata, E. Oda, T. Taniguchi. 1998. Involvement of the IRF family transcription factor IRF-3 in virus-induced activation of the IFN-β gene. FEBS Lett. 425: 112-116. Marie, I., J. E. Durbin, D. E. Levy. 1998. Differential viral induction of distinct interferon-α genes by positive feedback through interferon regulatory factor-7. EMBO J. 17: 6660-6669. Lin, R. T., C. Heylbroeck, P. M. Pitha, J. Hiscott. 1998. Virus-dependent phosphorylation of the IRF-3 transcription factor regulates nuclear translocation, transactivation potential, and proteasome-mediated degradation. Mol. Cell. Biol. 18: 2986-2996. Au, W. C., P. A. Moore, D. W. LaFleur, B. Tombal, P. M. Pitha. 1998. Characterization of the interferon regulatory factor-7 and its potential role in the transcription activation of interferon A genes. J. Biol. Chem. 273: 29210-29217. Zhang, L., J. S. Pagano. 1997. IRF-7, a new interferon regulatory factor associated with Epstein-Barr virus latency. Mol. Cell. Biol. 17: 5748-5757. Nguyen, H., J. Hiscott, P. M. Pitha. 1997. The growing family of interferon regulatory factors. Cytokine Growth Factor Rev. 8: 293-312. Taniguchi, T., K. Ogasawara, A. Takaoka, N. Tanaka. 2001. IRF family of transcription factors as regulators of host defense. Annu. Rev. Immunol. 19: 623-655. Reich, N. C., J. E. Darnell. 1989. Differential binding of interferon-induced factors to an oligonucleotide that mediates transcriptional activation. Nucleic Acids Res. 17: 3415-3424. Escalante, C. R., J. M. Yie, D. Thanos, A. K. Aggarwal. 1997. Expression, purification, and co-crystallization of IRF-I bound to the interferon-β element PRDI. FEBS Lett. 414: 219-220. Fujii, Y., T. Shimizu, M. Kusumoto, Y. Kyogoku, T. Taniguchi, T. Hakoshima. 1999. Crystal structure of an IRF-DNA complex reveals novel DNA recognition and cooperative binding to a tandem repeat of core sequences. EMBO J. 18: 5028-5041. Reich, N., B. Evans, D. Levy, D. Fahey, E. Knight, J. E. Darnell. 1987. Interferon-induced transcription of a gene encoding a 15-kDa protein depends on an upstream enhancer element. Proc. Natl. Acad. Sci. USA 84: 6394-6398. Kim, T. K., T. Maniatis. 1998. The mechanism of transcriptional synergy of an in vitro assembled interferon-β enhancesome. Mol. Cell 1: 119-129. Harada, H., T. Fujita, M. Miyamoto, Y. Kimura, M. Maruyama, A. Furia, T. Miyata, T. Taniguchi. 1989. Structurally similar but functionally distinct factors, IRF-1 and IRF-2, bind to the same regulatory elements of IFN and IFN-inducible genes. Cell 58: 729-739. Panne, D., T. Maniatis, S. C. Harrison. 2004. Crystal structure of ATF-2/c-Jun and IRF-3 bound to the interferon-β enhancer. EMBO J. 23: 4384-4393. Sato, M., H. Suemori, N. Hata, M. Asagiri, K. Ogasawara, K. Nakao, T. Nakaya, M. Katsuki, S. Noguchi, N. Tanaka, T. Taniguchi. 2000. Distinct and essential roles of transcription factors IRF-3 and IRF-7 in response to viruses for IFN-α/β gene induction. Immunity 13: 539-548. Alexopoulou, L., A. C. Holt, R. Medzhitov, R. A. Flavell. 2001. Recognition of double-stranded RNA and activation of NF-κB by Toll-like receptor 3. Nature 413: 732-738. Doyle, S. E., S. A. Vaidya, R. O’Connell, H. Dadgostar, P. W. Dempsey, T. T. Wu, G. Rao, R. Sun, M. E. Haberland, R. L. Modlin, G. Cheng. 2002. IRF3 mediates a TLR3/TLR4-specific antiviral gene program. Immunity 17: 251-263. Reich, N. C.. 2002. Nuclear/cytoplasmic localization of IRFs in response to viral infection or interferon stimulation. J. Interferon Cytokine Res. 22: 103-109. Yoneyama, M., W. Suhara, T. Fujita. 2002. Control of IRF-3 activation by phosphorylation. J. Interferon Cytokine Res. 22: 73-76. Fitzgerald, K. A., S. M. McWhirter, K. L. Faia, D. C. Rowe, E. Latz, D. T. Golenbock, A. J. Coyle, S. M. Liao, T. Maniatis. 2003. IKKε and TBK1 are essential components of the IRF3 signaling pathway. Nat. Immunol. 4: 491-496. Sharma, S., B. R. tenOever, N. Grandvaux, G. P. Zhou, R. T. Lin, J. Hiscott. 2003. Triggering the interferon antiviral response through an IKK-related pathway. Science 300: 1148-1151. Hemmi, H., O. Takeuchi, S. Sato, M. Yamamoto, T. Kaisho, H. Sanjo, T. Kawai, K. Hoshino, K. Takeda, S. Akira. 2004. The roles of two IκB kinase-related kinases in lipopolysaccharide and double stranded RNA signaling and viral infection. J. Exp. Med. 199: 1641-1650. McWhirter, S. M., K. A. Fitzgerald, J. Rosains, D. C. Rowe, D. T. Golenbock, T. Maniatis. 2004. IFN-regulatory factor 3-dependent gene expression is defective in Tbk1-deficient mouse embryonic fibroblasts. Proc. Natl. Acad. Sci. USA 101: 233-238. Barnes, B. J., M. J. Kellum, K. E. Pinder, J. A. Frisancho, P. M. Pitha. 2003. Interferon regulatory factor 5, a novel mediator of cell cycle arrest and cell death. Cancer Res. 63: 6424-6431. Takaoka, A., H. Yanai, S. Kondo, G. Duncan, H. Negishi, T. Mizutani, S. Kano, K. Honda, Y. Ohba, T. W. Mak, T. Taniguchi. 2005. Integral role of IRF-5 in the gene induction programme activated by Toll-like receptors. Nature 434: 243-249. Schoenemeyer, A., B. J. Barnes, M. E. Mancl, E. Latz, N. Goutagny, P. M. Pitha, K. A. Fitzgerald, D. T. Golenbock. 2005. The interferon regulatory factor, IRF5, is a central mediator of Toll-like receptor 7 signaling. J. Biol. Chem. 280: 17005-17012. Barnes, B. J., M. J. Kellum, A. E. Field, P. M. Pitha. 2002. Multiple regulatory domains of IRF-5 control activation, cellular localization, and induction of chemokines that mediate recruitment of T lymphocytes. Mol. Cell. Biol. 22: 5721-5740. Weaver, B. K., O. Ando, K. P. Kumar, N. C. Reich. 2001. Apoptosis is promoted by the dsRNA-activated factor (DRAF1) during viral infection independent of the action of interferon or p53. FASEB J. 15: 501-514. Iwamura, T., M. Yoneyama, K. Yamaguchi, W. Suhara, W. Mori, K. Shiota, Y. Okabe, H. Namiki, T. Fujita. 2001. Induction of IRF-3/-7 kinase and NF-κB in response to double-stranded RNA and virus infection: common and unique pathways. Genes Cells 6: 375-388. Mancl, M. E., G. D. Hu, N. Sangster-Guity, S. L. Olshalsky, K. Hoops, P. Fitzgerald-Bocarsly, P. M. Pitha, K. Pinder, B. J. Barnes. 2005. Two discrete promoters regulate the alternatively spliced human interferon regulatory factor-5 isoforms. J. Biol. Chem. 280: 21078-21090. Chook, Y. M., G. Blobel. 2001. Karyopherins and nuclear import. Curr. Opin. Struct. Biol. 11: 703-715. Davis, L. I.. 1995. The nuclear pore complex. Annu. Rev. Biochem. 64: 865-896. Gorlich, D., U. Kutay. 1999. Transport between the cell nucleus and the cytoplasm. Annu. Rev. Cell Dev. Biol. 15: 607-660. Macara, I. G.. 2001. Transport into and out of the nucleus. Microbiol. Mol. Biol. Rev. 65: 570-594. Fornerod, M., M. Ohno, M. Yoshida, I. W. Mattaj. 1997. CRM1 is an export receptor for leucine-rich nuclear export signals. Cell 90: 1051-1060. McBride, K. M., C. McDonald, N. C. Reich. 2000. Nuclear export signal located within the DNA-binding domain of the STAT1 transcription factor. EMBO J. 19: 6196-6206. Kumar, K. P., K. M. McBride, B. K. Weaver, C. Dingwall, N. C. Reich. 2000. Regulated nuclear-cytoplasmic localization of interferon regulatory factor 3, a subunit of double-stranded RNA-activated factor 1. Mol. Cell. Biol. 20: 4159-4168. Lin, R. T., Y. Mamane, J. Hiscott. 1999. Structural and functional analysis of interferon regulatory factor 3: localization of the transactivation and autoinhibitory domains. Mol. Cell. Biol. 19: 2465-2474. Suhara, W., M. Yoneyama, T. Iwamura, S. Yoshimura, K. Tamura, H. Namiki, S. Aimoto, T. Fujita. 2000. Analyses of virus-induced homomeric and heteromeric protein associations between IRF-3 and coactivator CBP/p300. J. Biochem. 128: 301-307. Hu, G., M. E. Mancl, B. J. Barnes. 2005. Signaling through IFN regulatory factor-5 sensitizes p53-deficient tumors to DNA damage-induced apoptosis and cell death. Cancer Res. 65: 7403-7412. Heylbroeck, C., S. Balachandran, M. J. Servant, C. DeLuca, G. N. Barber, R. T. Lin, J. Hiscott. 2000. 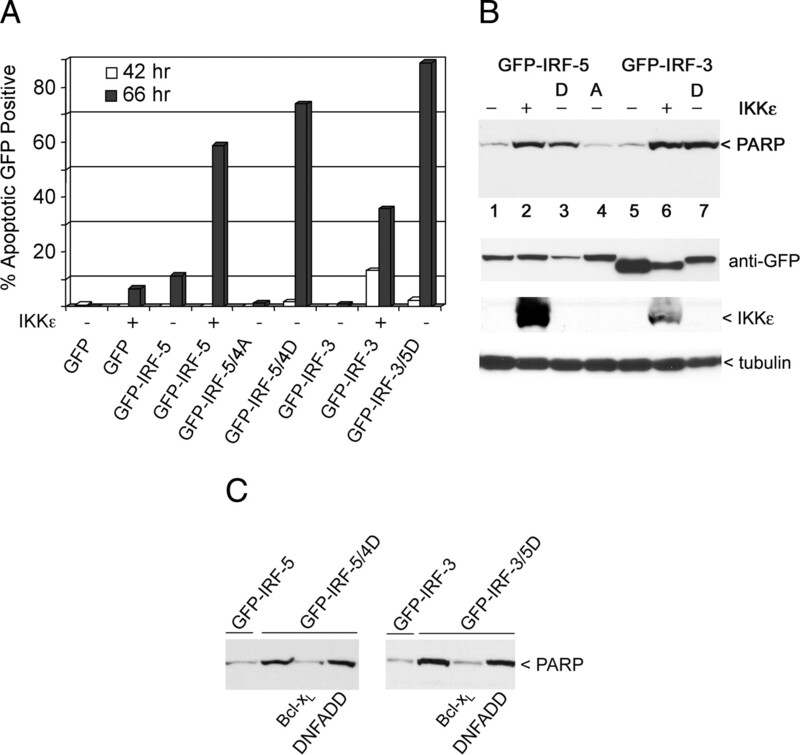 The IRF-3 transcription factor mediates sendai virus-induced apoptosis. J. Virol. 74: 3781-3792. Soldani, C., A. I. Scovassi. 2002. Poly(ADP-ribose) polymerase-1 cleavage during apoptosis: an update. Apoptosis 7: 321-328. Danial, N. N., S. J. Korsmeyer. 2004. Cell death: critical control points. Cell 116: 205-219. Tibbetts, M. D., L. Zheng, M. J. Lenardo. 2003. The death effector domain protein family: regulators of cellular homeostasis. Nat. Immunol. 4: 404-409. Barnes, B. J., P. A. Moore, P. M. Pitha. 2001. Virus-specific activation of a novel interferon regulatory factor, IRF-5, results in the induction of distinct interferon α genes. J. Biol. Chem. 276: 23382-23390. Barnes, B. J., J. Richards, M. Mancl, S. Hanash, L. Beretta, P. M. Pitha. 2004. Global and distinct targets of IRF-5 and IRF-7 during innate response to viral infection. J. Biol. Chem. 279: 45194-45207. Yoneyama, M., M. Kikuchi, T. Natsukawa, N. Shinobu, T. Imaizumi, M. Miyagishi, K. Taira, S. Akira, T. Fujita. 2004. The RNA helicase RIG-I has an essential function in double-stranded RNA-induced innate antiviral responses. Nat. Immunol. 5: 730-737. Kato, H., S. Sato, M. Yoneyama, M. Yamamoto, S. Uematsu, K. Matsui, T. Tsujimura, K. Takeda, T. Fujita, O. Takeuchi, S. Akira. 2005. Cell type-specific involvement of RIG-I in antiviral response. Immunity 23: 19-28. Lin, R. T., L. Yang, M. Arguello, C. Penafuerte, J. Hiscott. 2005. A CRM1-dependent nuclear export pathway is involved in the regulation of IRF-5 subcellular localization. J. Biol. Chem. 280: 3088-3095. Balachandran, S., E. Thomas, G. N. Barber. 2004. A FADD-dependent innate immune mechanism in mammalian cells. Nature 432: 401-405.